Yes, that’s right. You can now deck out your vehicle’s interior with the very popular, lifestyle camouflage that many of us have grown to know and love. Just when you thought you couldn’t find any more camo car accessories, right? Known for its casual wear that not only stands out due to its unique product names, but also for its bold camo patterns, Moon Shine has become a favorite among hunters and outdoor enthusiasts. All of our Luxury Line Moon Shine Seat Covers for cars and trucks are made of a tough, highly water resistant and abrasion resistant, material. A perfect choice for outdoor-lovers, especially now that you can get it in your favorite Moon Shine Camo pattern! Moon Shine, the ultimate lifestyle camo, is available in our high-end Luxury Line. 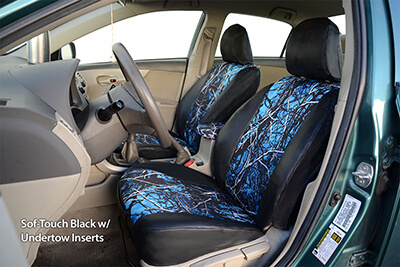 Our Moon Shine Camo Seat Covers will not only show off your adventurous side, they will also give your car, truck, or van an awesome makeover! Better yet, as a part of our Luxury Line, you’re getting the best of the best in terms of quality and fit. Our Luxury Products are tailor-made specifically to your exact year, make, and model. Only top of the line automotive grade material is selected to produce this extremely high end product. Moon Shine Ain’t Your Average Joe Schmoe Camo! What’s Your Favorite? Unlike any other wooded camouflage out there, the Moon Shine Wildfire with its fiery background and outstanding graphics cannot be beat. The vibrant red and orange colors combined with the wooded Moon Shine Camo pattern depict the true essence of being an outdoor enthusiast. There’s nothing like heading out to find that perfect hidden camping spot away from the urban world. Moon Shine Wildfire is a symbol of your bold sense of adventure in the wilderness. Now when you’re out there enjoying the wilderness, your vehicle’s upholstery will remain clean, dirt-free, and dry with these high-end Luxury Seat Covers. 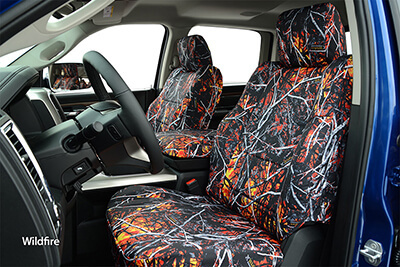 When people see these Wildfire camo seat covers with the crackling wood and fierce flames, there will be no doubt in their mind that you’re a lover of the woods and all things wild. It takes great skill, accuracy, patience, and of course, assertiveness to be a successful hunter. Harvest Moon Camo by Moon Shine with its intricate detail and subtle colors of grey and black illustrate the stealthy state of mind one needs while hunting. Highly protective seat covers are important when you’re out hunting. You won’t have to worry about hunting gear dirtying up your interior. All you need to do is focus and keep your eye on the target. Hunting is a lifestyle choice. Even when you’re not in the backwoods during hunting season, you carry that same mindset. Harvest Moon seat covers are not your average camo seat covers, just like you’re not an average hunter. You are the stealthy, assertive, and noble hunter that never misses. 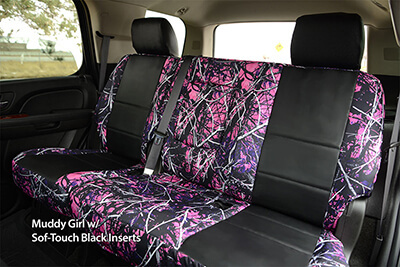 Not only are the Muddy Girl Camo Seat Covers a perfect match for those that aren’t afraid of roughing it, this Moon Shine pattern is for those who embrace it. The vivid shades of purple and pink add a bit of femininity to the bold camo design. Show off your adventurous lifestyle filled with camping trips, mountain climbing, hunting and any other exciting outdoor excursions you take on. Our Luxury Line Moon Shine Seat Covers take things to a whole other level in terms of fitment. This tailor-made product will fit perfectly to your seats and all the contours and grooves. That’s a guarantee! These Muddy Girl Seat Covers are more than just an automotive accessory. They’re an extension of your life. There’s no stopping you from seeking out new outdoor experience and grabbing the bull by its horns! Whether you’re a fisherman, a diver or water sports fanatic, this Camo pattern embodies the ocean, just like you. The vibrant colors and lifelike graphics of the Undertow Seat Covers are so real you can almost hear the waves crashing while you’re driving. We’d like to think so anyways. 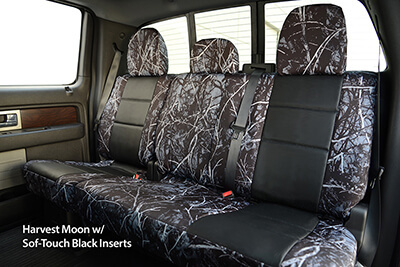 To add even more customization to your Moon Shine Seat Covers, you can pair up any Moon Shine pattern with our Luxury Exotic Line too! This is where things really get wild. With a pattern looking like something out of a horror movie, there’s no better way of showing off your flare for adventure and tackling whatever is out there -- even zombies! The gruesome green and yellow glow takes on a life of its own where its acidic look is so realistic you it just might could spew right out of the fabric. 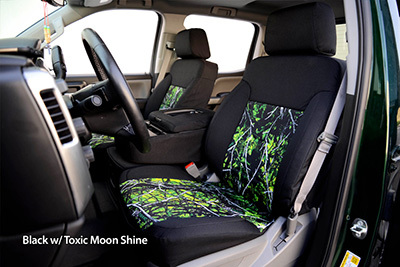 With Moon Shine Camo Toxic Seat Covers, your vehicle will stand out and show off your exciting lifestyle. Willing to tackle any kind of terrain, even one that may be less than friendly, like a zombie-esque toxic waste zone. Regardless of what your favorite outdoor activity is, our luxury lifestyle Moon Shine Camo Seat Covers offer exceptional protection and superior fit. Choose from any of our pattern to match your adventure and go have fun!